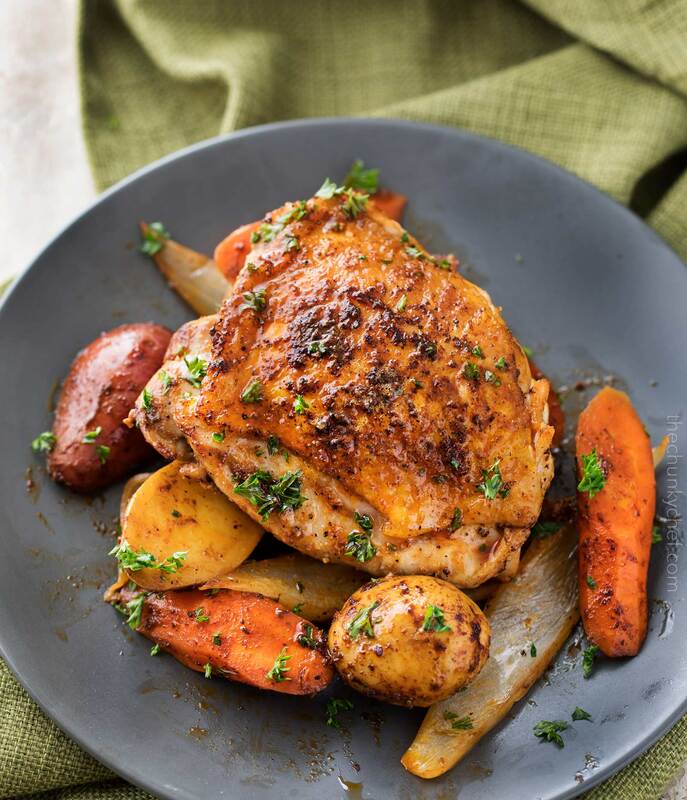 Classic chicken and roasted vegetables, made in the slow cooker and absolutely loaded with bold, spicy flavors from the Harissa! Classic slow cooker comfort food, with the added bonus of bold Harissa paste! 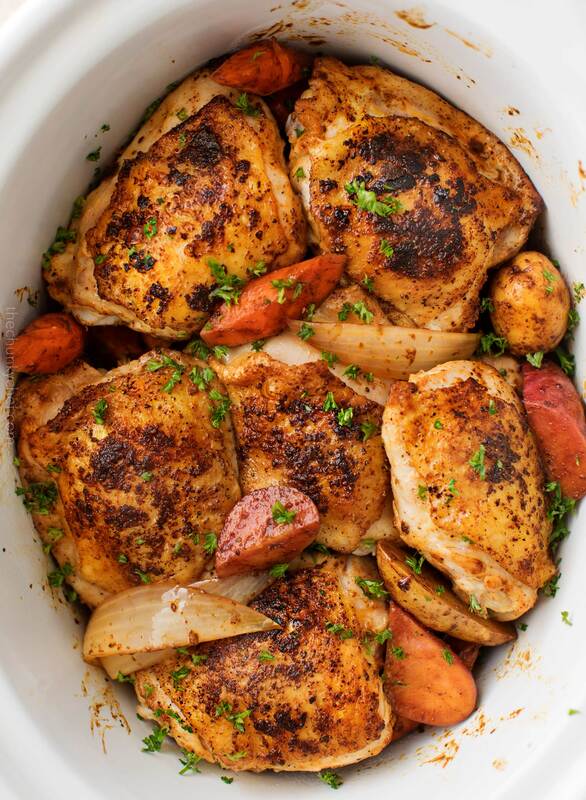 Chicken, potatoes, carrots and onion slathered in a rich, spicy spice mix and slow cooked to perfection! Tired of the same old boring chicken? I hear you! We eat quite a bit of chicken here in The Chunky Chef household, especially now after starting my new weight watchers blog (and finding out chicken is a zero point food!). 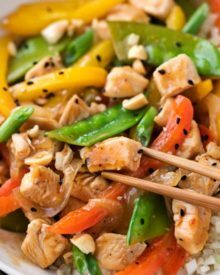 It’s SO versatile, yet it’s also incredibly easy to fall into cooking the same 2-3 chicken recipe over and over again. We call it the chicken rut… and it’s real folks! I have plenty of chicken recipes to break you out of that rut (here they are! ), but this one is a new favorite! Why is it our new favorite? First of all, it’s incredibly easy! After a quick sear in the skillet, everything goes in the slow cooker and it does the work for you. Secondly, it’s a flavor-powerhouse thanks to a fantastic ingredient… Harissa paste. Have you tried it? It’s a bold spice paste that hails from North Africa. You can make your own, or pick it up at your local grocery store. Most larger chains will carry it in either the hot sauce section or the International Foods section. Typically harissa is made from a blend of smoked hot chile peppers, garlic, olive oil and spices, such as cumin, coriander, caraway and mint. Harissa recipes can vary from region to region as well. WHAT CAN I DO WITH HARISSA PASTE? Now that I’ve tried it, I’m finding SO many great uses for this flavor-packed ingredient. Mix some into some delicious homemade hummus, mix it into some ketchup for a fantastic burger/hot dog condiment, try it with some fried eggs, or combine some honey and lime juice and toss your chicken wings in it… the sky is the limit! I know it may seem weird to not add any liquid to the slow cooker, but trust me, you don’t need any. 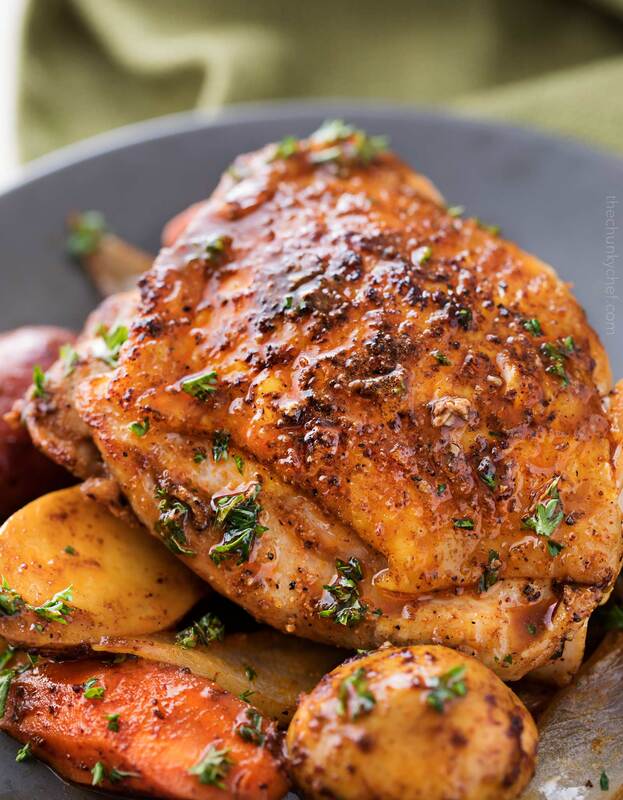 Whatever you put into a slow cooker will give off liquid, so the chicken gives off plenty of flavorful liquid, which soak into the vegetables as they cook and gives you a luxurious sauce at the end! Sear first! That gorgeous golden brown color will only come from searing the chicken. Don’t care for chicken skin? No worries, just pick up some bone-in skinless chicken thighs if your store has them, or buy regular bone-in skin on chicken thighs and remove the skin yourself. WANT TO TRY THIS HARISSA CHICKEN? PIN IT TO YOUR SLOW COOKER OR DINNER BOARD TO SAVE FOR LATER! To the bottom of a 6 quart slow cooker, add the Harissa paste and 1 Tbsp of the olive oil. Add onion, potatoes, carrots and 1/2 tsp salt and stir gently to combine. In a small bowl, add garlic powder, smoked paprika, pepper and remaining 1/2 tsp salt. Stir, and sprinkle evenly over chicken thighs. Add remaining 1 Tbsp olive oil to a large skillet and heat over MED-HIGH. Add chicken thighs, skin side down, and cook 4-5 minutes, until golden brown. Place browned chicken thighs over the top of vegetables in slow cooker. For extra harissa flavor, spoon some paste over the chicken and spread to cover. Cover and cook on LOW for 8 hours. Serve chicken thighs with vegetables and a spoonful of cooking juices spooned over the top. Garnish with parsley and a squeeze of fresh lemon juice. If you prefer chicken things with no skin, either buy bone-IN skinless chicken thighs, or take the bone-in skin on thighs and remove the skin with a sharp knife. I prefer to debone my chicken thighs. Will this recipe still work fine with that? It will, although it may not take as long in the slow cooker. 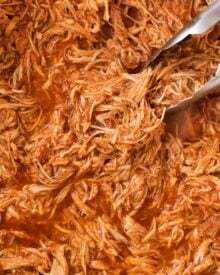 I love making slow cooker chicken – but I’ve never included harissa in the recipe I usually make! 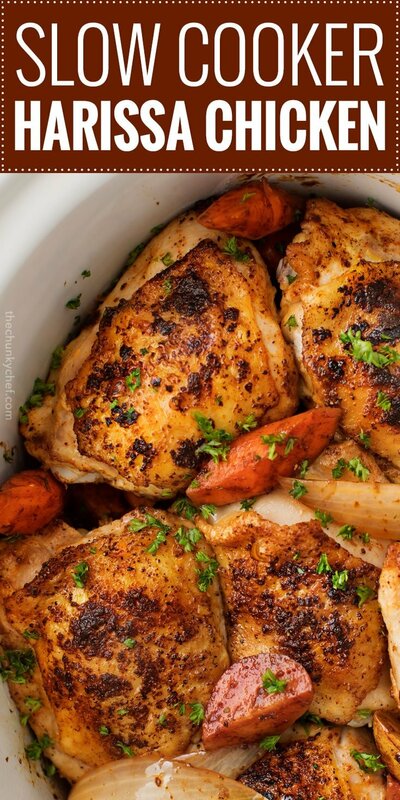 Definitely want to try this one the next time I throw some chicken in the slow cooker! Thank you so much for sharing, love harissa! 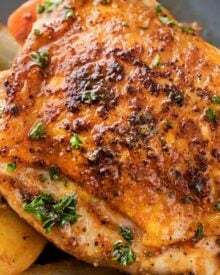 Good idea to chose Harissa for your recipe of chicken. Harissa gives such an awesome kick to everything! It’s like an explosion of flavors in your mouth. This slow cooker meal is a must-make! 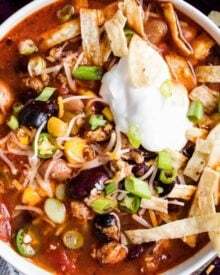 What a great slow cooker recipe! Adding to my menu for next week! I’ve never heard of this paste before. The flavors sound fantastic! Such a fantastic idea! Can’t wait to try this chicken recipe! We eat a ton of chicken too, so I’m always looking for new chicken recipes. This looks wonderful! What a great dish with such bold flavors! Perfect way to change up the routine and try something new!